The Chicago-bred rapper, whose full name is Chancelor Bennett, announced in a news conference Monday that he would be donating $1 million to the Chicago Public School system. "As a CPS graduate, Chance has shown Chicago students not only the heights they can achieve but the generosity they can share," school district spokesperson Emily Bittner said in a statement. "We also appreciate his strong advocacy for Chicago schoolchildren, who suffer under the state's discriminatory system of funding, which Gov. Rauner continues to perpetuate." 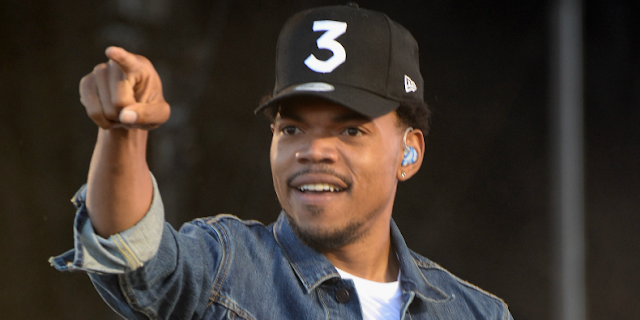 "Today, I'm proud to announce that I am donating $1 million to CPS to support arts and enrichment programming," Chance said in the news conference at Westcott Elementary School on the South Side of Chicago. The announcement comes just days after the three-time Grammy-award-winning rapper brokered a half-hour meeting with the Republican governor after an exchange on Twitter. "He gave me a lot of vague answers, so we'll see what happens," the rapper told reporters Friday after the two met. On Monday, Chance said he and the governor spoke by phone over the weekend, but the talks did not yield a solution. Last month, school officials announced they would freeze $46 million in spending after Rauner vetoed a $215 million funding bill that schools were relying on. "Gov. Rauner's actions cement a racially biased funding system that is also the worst in the country for children living in poverty," Chicago Public Schools CEO Forrest Claypool said in a press release at the time. "Gov. Rauner did not create this unjust system, but he has chosen to perpetuate it, violating the civil rights of hundreds of thousands of Chicago schoolchildren and threatening their futures." Just over a week later, the Chicago Board of Education and five families of Chicago students brought a lawsuit against the state of Illinois, alleging it prioritizes state funding for schools outside Chicago based on race. "While the Rauners are passionate donors to our schools, individual contributions will never be enough to address the financial challenges facing CPS," said Eleni Demertzis, a spokeswoman for the governor's office, in a statement Monday. "It would be helpful if CPS officials came to Springfield and joined in serious good faith discussions about the long-term stability of all of our schools." She also pointed out the near $20 million the Rauners have donated to Illinois education initiatives since 1997. Chance's announcement came as the governor's staff was looking for its own solution to the $215 million deficit. A couple of options were outlined in a memo sent Monday to Rauner's chief of staff. One involved asking Mayor Rahm Emanuel to transfer $215 million in Tax Increment Financing dollars. The other choice was to add the school district's request to SB16, a bill involving state employee pension packages making its way through the state Senate. When asked about the steps the governor has taken, Chance said it was Rauner's responsibility to ensure children of Chicago receive a quality education. "I want them to fund CPS," he said. "It's not my job to propose any policy or be behind anything other than the kids." Chance the Rapper also encouraged companies in Chicago and around the country to donate to Chicago schools, calling his contribution "a call to action." In addition to the $1 million, Chance announced that for every $100,000 raised, SocialWorks, a nonprofit organization the rapper co-founded, would donate $10,000, starting with Westcott Elementary School. "While I'm frustrated and disappointed in the governor's inaction, that will not stop me from continuing to do all I can to support Chicago's most valuable resource: it's children," he said. Chance has also updated his website with a link to support Chicago Public Schools. Learn more here. Read “Charting Chance the Rapper’s Unsigned Success,” as well as Chance’s foreword to Kevin Coval’s A People’s History of Chicago on the Pitch. 0 Response to "Chance the Rapper donates $1 million to Chicago Public Schools"